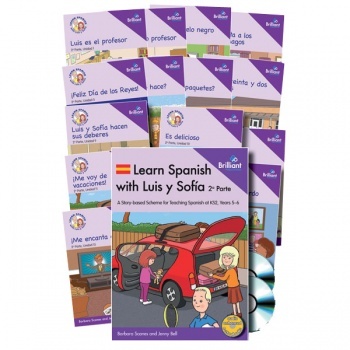 Learn Spanish with Luis y Sofía is a story-based approach to teaching Spanish at Key Stage 2. It comprises of two stages: Part 1 for Years 3–4 (7–9 year olds) and Part 2 for Years 5–6 (9–11 year olds). As well as a collection of story / reading books, specially written entirely in Spanish, this scheme will provide you with a wealth of creative teaching ideas to ensure complete coverage of the Foreign Language Programmes of Study in the September 2014 National Curriculum. Each of the 28 units (14 per stage) is based around a story featuring a young brother and sister (Luis & Sofía), their friends and their family. The stories are topic-based and introduce vocabulary and language structures relating to the topic, through simple Spanish sentences. Unidad 5: ¡Feliz Día de los Reyes! Unidad 6: ¿Qué tiempo hace? Unidad 11: ¡Me voy de vacaciones! Unidad 13: ¡Me encanta el fútbol! Contains translations of the stories and lesson plans, exercises, games and activities linked to the stories, focusing on enabling pupils to communicate in Spanish. 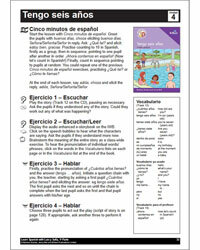 acted out by native Spanish speakers, along with the songs, vocabulary introduced and listening exercises. Contains audio-enhanced e-book versions of all of the stories, a PDF of the teacherʼs book, along with games, vocabulary files and sentence building activities for use on an IWB. The scheme is designed with non-specialists in mind and will make implementing the new National Curriculum for England easy. Self-assessment sheets make it easy to monitor children’s progress and ensure coverage of all the Programmes of Study. Learn Spanish with Luis y Sofía: 2a Parte Starter Pack is aimed at beginners and is a suitable resource for a non-specialist teacher.